Hiking the Appalachian Trail is hard. And that is the verdict by Bill Bryson, the author of A Walk in the Woods. The narrative commences with Bryson’s curiosity of hiking this Trail and then getting ready to do the hike. After purchasing all the necessary equipment he proceeds to call a number of friends and acquaintances who would be willing to accompany him; he gets one volunteer from Iowa, Stephen Katz whom he has not seen or heard from in quite a while. Even though Katz is a recovering alcoholic, Bryson accepts him as his companion on this hiking trip. The Trail is approximately 2,000 miles or 3,500 km spreading from Georgia to Maine with a wide range of magnificent mountains, hills, streams, lakes and stunning views. While on the trail, Bryson takes the lead and soon discovers that Katz is unable to keep pace with him and moves forward, all the while, keeping an eye back on his companion. When they meet, Katz, who is overweight, is puffing, out of breath, cursing and defiantly tells Bryson that he had to ditch most of what he packed. And thus, the hike continues. Bryson recounts hilarious anecdotes of interactions with people they meet, share resting time or nights in the shelters. It becomes more and more difficult to conquer walking this Trail. They skip a great part of the Trail and take a ride to Roanoke, Virginia for a more pleasant or easier walk in these woods. After covering 800 miles or 1,300km they stop as each returns home. 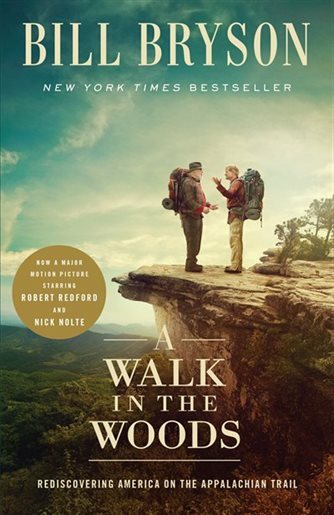 Throughout Bryson infuses humour, along with in depth descriptions of its history, the health of the woods and how this Trail has evolved over time. A Walk in the Woods is a travel memoir that captures the reader’s imagination and educates in an interesting, entertaining manner.